One of SOMA’s key annual events provides students a chance to network with companies such as Disney, Amazon, Google, Amgen, and more. In 2018, the Career Night will be jointly organized by SOMA along with the Investment Finance Association. It will provide a larger platform for students and recruiters to connect on a wide variety of opportunities across Corporate Strategy, Operations, Analytics and Corporate Finance functions. The tentative date is November 6th, 2018. Club members get a chance to show-off and further hone their analytics, critical thinking, leadership, and presentation skills through several case competitions. 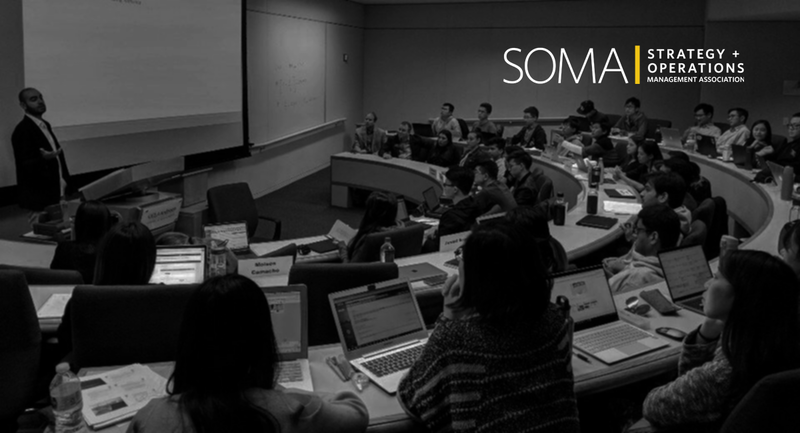 SOMA creates avenues for a number of case competitions throughout the year and gives access to members to participate in on-campus, inter-school, and online competitions. Whether from SOMA’s resident student experts or from partners like Cognitir, SOMA members have many opportunities to learn analytics and be fully data-science-ready before their summer internship or full time jobs! Some of the typical workshops include full day sessions on Data Sciences such as R, Python, Visualization and Storytelling, and shorter hands-on sessions on SQL and Tableau. SOMA organizes Interview Preparation Workshops to prepare club members recruiting for the core functions represented by the club. These workshops are organized by second-years who were successful in their internship search, and include mock-interview practice along with case studies typically expected in corporate interviews. Days on the Job (DOJs) are organized to give students the opportunity to visit company campuses, interact with recruiters and alumni, and often get critical recruiting tips. SOMA has previously organized DOJs to companies such as Amgen, Amazon, etc. in the LA area. SOMA gives opportunities to students to interact with recruiters and professionals in a smaller group setting through dinners for 4 or 8. SOMA brings industry talent to campus to educate students on what the real world looks like. Speaker Series and Discussion Forums in partnership with Center for Global Management are some of the events scheduled for this year.